The MI6 roster of personnel includes hundreds of agents world-wide, although most of the publicity seems to have been focused on those agents that occupy the most elite level of respect within the halls of MI6: the famed ‘double O’ agents. Almost immediately upon the release of the first group of declassified MI6 mission documents the public’s fascination with all things concerning ‘secret agents’ was captured. 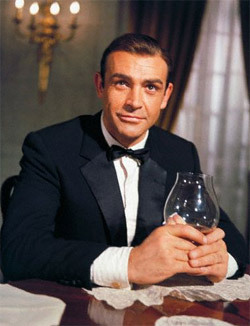 James Bond, a former Commander in the British Navy, quickly became one of the few agents trusted and qualified within MI6 to obtain ‘double O’ status. Early education includes Eton college, and then later Cambridge University where he specialized in many foreign languages. An eventual stint in British Naval Intelligence, leading to the Special Forces earned him class A-1 ratings in nearly every type of hand-to-hand combat as well as all types of firearms and bladed weapons use. The ‘Quartermaster Branch’, the tactical equipment and weapons division within MI6 is responsible for the design, development and construction of nearly all of the specialized devices and equipment that an MI6 operative will use on any particular mission. Usually referred to as ‘Q-Branch’, the division’s director Major Boothroyd is most often referred to as a simply ‘Q’. ‘Q-Branch’ has had a long-standing relationship with some of the world’s finest automotive manufacturers. These collaborations have resulted in a staggering array of automobiles with an equally amazing assortment of very special abilities and other ‘options’ not available to the general public for any price. Bond(#007), from the list of all MI6 #00_ agents has had by far the most varied assortment of ‘Q-modified’ vehicles issued to him for use on his missions over the years, so we will focus on a list of the most spectacular vehicles with some descriptions of their customized abilities. Naturally, there are many classified items about these and many other vehicles, so this will obviously be only a list of cars and items that are declassified. Politics will demand certain decisions be tilted in a specific direction and the politics of a government agency such as MI6 demanded at the time that any vehicles procured for MI6 use would necessarily be of British origin. This left only one vehicle really, one that could meet the external traits of an ordinary, if flamboyant citizen like James Bond while providing the potential for subtle modifications necessary for a British agent like ‘007’. ‘Q’ and Aston-Martin worked closely to develop the MI6 Aston-Martin DB5. The DB5 was quite the automobile before ‘Q’ got a hold of it: It’s 4.0 litre inline 6-cylinder engine was a marvel of highly-tuned precision and developed 282 horsepower, which could easily propel the car from rest to over 60 MPH in under 8 seconds. The ‘Q’ modifications were all installed in such a way as to be totally invisible unless called upon by the driver of this remarkable car. Underneath the driver’s center armrest lid were the controls for the cars amazing defensive as well as offensive armaments. While driving, 007 could select from an array of offensive weapons, including twin Browning .30 caliber machine guns hidden behind the swing-down front indicators. Likewise, the front and rear bumper over-riders could be actuated on extending hydraulic rams to act as deadly battering rams. 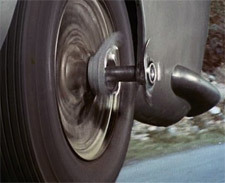 The three-spoke center hubs on the wire-wheels of the DB5 may have looked like nothing more than mere ornamentation, but the rear wheels were equipped with maybe the ultimate defensive driving tool: The wheel’s center hubs could be extended 2 feet, while counter-rotating on a steel rod. This would effectively slash the tires of any vehicle in the lane next to the car, rendering it unable to continue driving. The exhaust pipes of the car housed an auxiliary tube that would emit thick, acrid smoke at the touch of a button, making a close pursuit nearly impossible. If that was not enough, oil jets hidden behind the taillight assemblies would render the road behind the DB5 too slippery to navigate. And finally, the rear offensive weaponry included many sharpened three-prong ‘calthrops’ that could be dropped into a pursuing vehicle’s path, bursting its tires and ending the pursuit right there. Defensive items included a bullet-proofed shield that could be raised directly behind the rear windscreen for occupant protection, as well as a unique rotating license plate assembly that would confuse any attempt at identification. The normal plate of BMT 216A would have been valid in the UK, while the optional plates of LU 6789 signified a Swiss registrant and the French registration showed on the third plate as 4711-EA-62. A unique sliding tray under the driver’s seat housed a folding rifle with a telescopic sight, a Mauser automatic pistol, and a small supply of hand grenades and throwing knives. Directly in front of the driver, and concealed behind a sliding panel was the display screen for the built-in tracking and radar system. And finally, in the unfortunate circumstance that Bond would find himself with an enemy agent seated next to him in the DB5, the gear-shift lever housed a discreet flip-top lid that would expose a button, which would in turn activate the awesome passenger ejector seat mechanism. Upon the pressing of the ejector seat button, a panel on the roof would release and the passenger and seat would be violently propelled 40 feet straight upwards by a powerful compressed-air cannon assembly hidden within the seat itself. By the time the unfortunate victim of the ejector seat recovered (if at all), Bond and the DB5 would have been well on their way to safety. 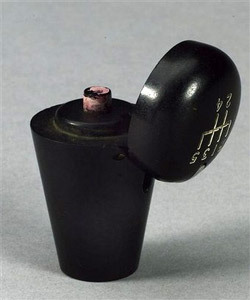 Even though there are rumors of Bond stating that ‘Q’ “must be joking” when he was shown the ejector seat feature during the initial mission briefing on the modified DB5, Q’s response that “I never joke about my work” was shown to be all too truthful, as the records indicate that Bond did indeed use the ejector seat in just such a emergency during that very mission. The DB5 served Bond well for several years, and as it was initially chosen to coincide with his casual lifestyle in between missions, it served dual duty as his daily driver. However, careful review of the released documents seem to show that Bond was particularly demanding on the equipment issued to him ,even more so than his ‘double 0’ brethren. Subsequently, the DB5 was retired from ‘active MI6 duty’ only a few short years after it was first commissioned. Apparently, that is not the complete story behind the DB5, however. 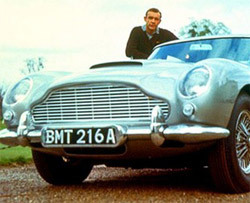 Even though the released records indicate that Bond has been issued many varied and current-model vehicles over the years for use on his assignments, there are those within other branches of the British intelligence community that claim to have witnessed Bond using a ‘birch silver’ 60s-era DB5 as his personal means of local transport between assignments. Although it is not known if this is the same vehicle that Bond used on his missions in the 60s, or if Bond is just fond of the classic Aston Martin DB5 and has sought out a suitable example of the same, it brings to mind one curious question: If this is the actual DB5 used on those missions from long ago, are the ‘Q modifications’ still installed?